From the moment I mentioned the Moleskine Messenger Bag in a post a few months ago about the new Travelling Collection including bags and laptop cases, I have recieved two or three hits from google every day from people searching for a Moleskine Messenger Bag Review. Now no one can say I don’t deliver! Luckily enough for me, my current work bag had almost served its sentence and it was about time to upgrade. Off I headed to Notemaker, and a few days later I had in my hot little hands the new, super-awesome messenger bag from one of my favourite stationery brands. There were a few things which I had been wondering about the bag itself ever since it was announced. How many inner pockets were there? How long is the shoulder strap? Is it actually worth the price? Coming in at over $150AU it is not a small investment for a bag. It seemed that nowhere online had much information on it. Well, to sum up… Yes, it’s totally worth it. The first thing that struck me when I pulled off the plastic was the quality. From the smooth, luscious exterior which just makes you want to touch it, to the funky cream-coloured velour lining pretty much everywhere else, the bag is well made. 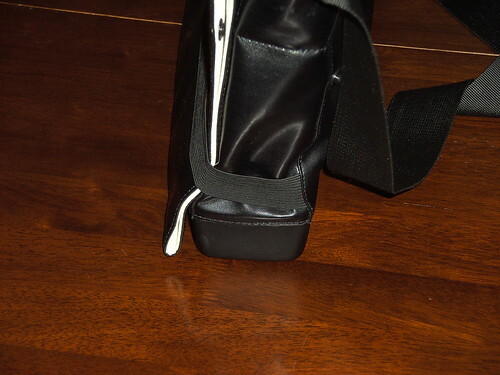 Starting from the outside, the shoulder strap is long enough for me (Being a 6foot 3inches tall male), the bag rests just below my waist, which is where I find it comfortable. 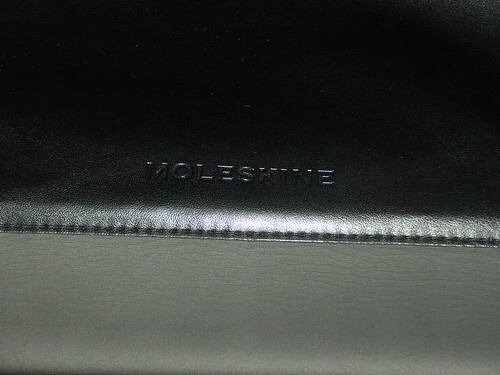 The exterior is said to be the same material they use for the covers of Soft Cover Moleskine notebooks. I have one of these, and they don’t feel exactly the same. The bag feels a bit finer than the notebook, which is fine by me. 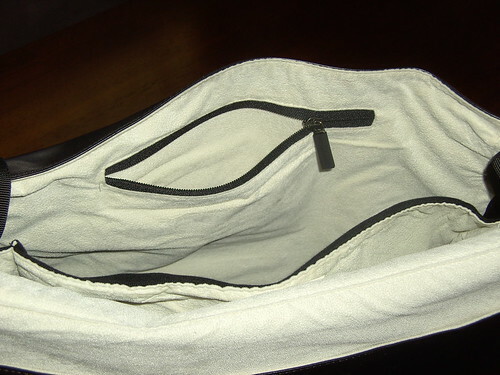 An interesting thing about the flap lid is it actually opens completely out (see picture) and the bag has snap-locks on the back which allow you to completely wrap around the flap, stopping any chance of rain or stuff falling out. 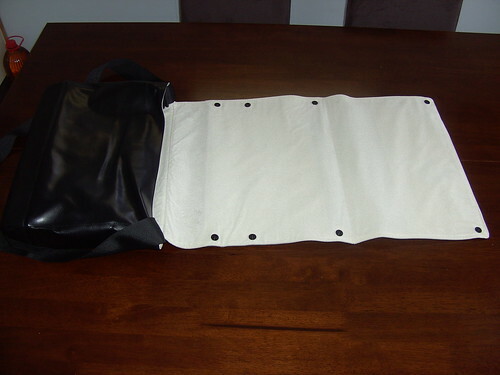 The bag has an elastic closure strap, designed to resemble the notebooks. I think this idea is excellent, as my old work bag had metal buckles which when left unbuckled, used to make a whole lot of noise while walking. The elastic strap gives you the ability to walk around with the bag open if you want and not annoy everyone in your vicinity. The strap also does a pretty good job at keeping the bag closed. 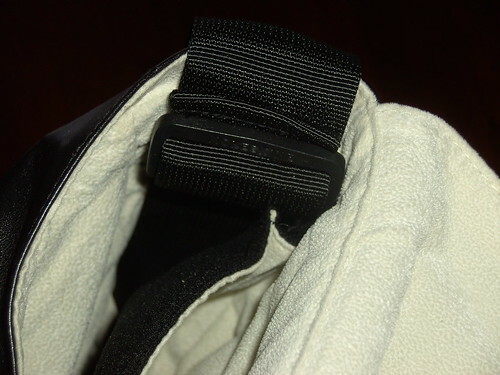 If you try and grab the bag in the middle and lift, the flap can come out of the elastic, but generally you would pick it up by the shoulder strap anyway. 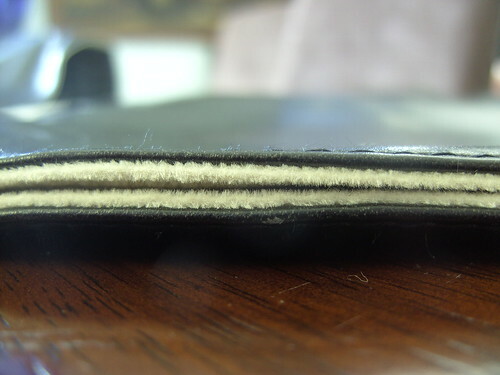 On the back in the “typical” place is the embossed, Moleskine logo. It’s about 3 inches wide, and really sets off the back of the bag. 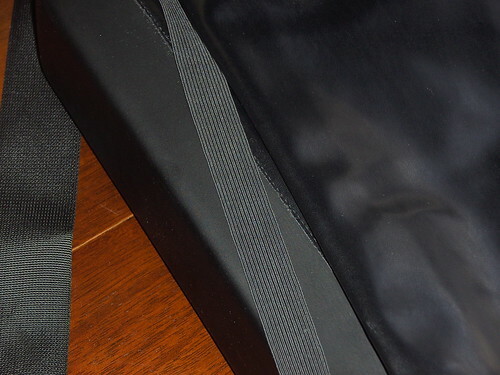 What you might also be able to see in the photo above is the difference between the base of the bag. It’s a firm, black plastic moulded to shape, allowing the bag to stand up even when full of oddly shaped goodies. 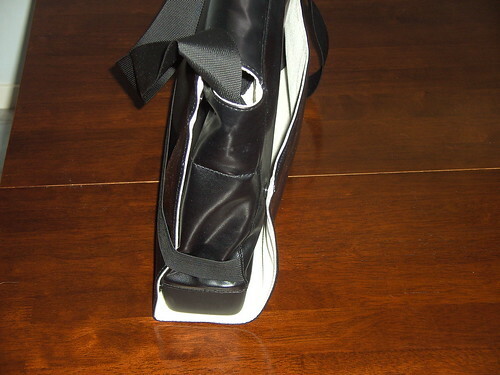 Moving inside the bag, we see the stark contrast between the black exterior and the cream interior. I imagine that it would stain easily, so make sure you keep your fountain pens capped! There are two compartments. 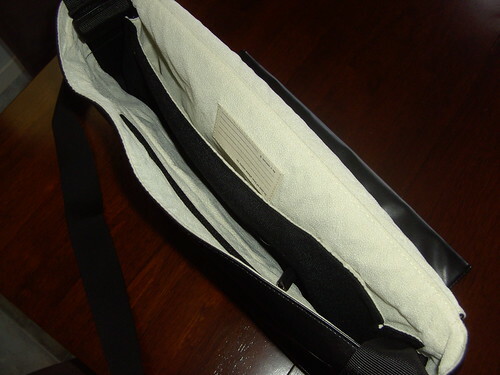 The back one designed to laptops with up to 15″ screens (it works for my Netbook with a 10″ screen as well) and the front compartment, which has most of the room and solid base. 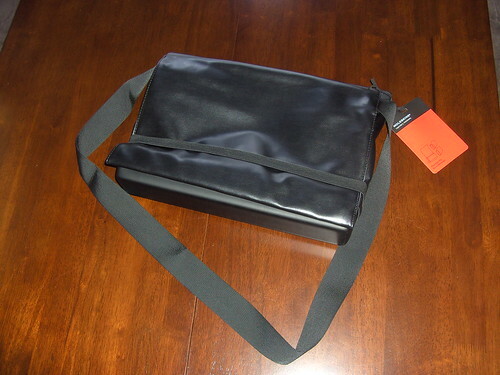 As you can see above, the bag also has a small, zipped compartment the size of a large Moleskine notebook. Have a guess what it’s for? Well, it isn’t large Moleskine notebooks. They actually DO NOT fit into this pocket. I was quite surprised when I tried, but there was just no chance of getting it in there. I guess I am going to have to stick to my Field Notes or Pocket sized notebooks. In the compartment you will find a small (rather cute) soft-cover Moleskine book with a few blank pages and the history of the brand. I’ll leave it out of the pictures so you can be as pleasantly surprised as I was. 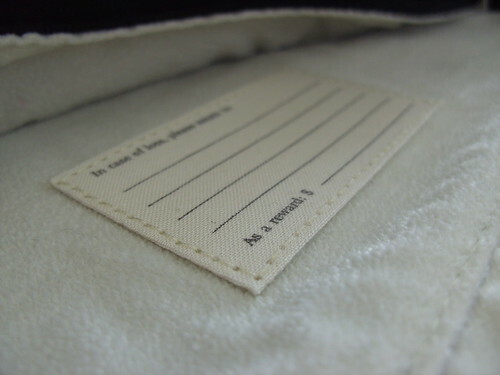 Sewn into the back we also find the trademark Moleskine “In case of Loss” tag. 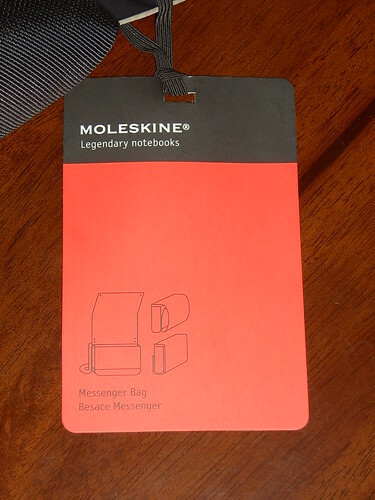 I think this is more handy in a bag than a notebook, however in the end it will depend on the person who finds it. The buckle is nice and solid, and has the Moleskine name stamped into it as well. These are inside the bag itself, helping keep the minimalist aesthetic of the bag no matter how short or long you want the strap. The buckles and the back are the only places you will find the logo. Over all I am extremely happy with the bag. There is the odd size of the inner pocket, and the price, but I still feel it’s justified. I will most likely do a re-visit post with my impressions of it after taking it to work every day for a few months. For the moment, I am one happy traveller. If you have any questions, or would like to suggest something else for me to review, please leave a comment. I make a point of answering every one I get. To be honest, it’s holding up worse than I had hoped. Definitely not worth full price unfortunately. Hopefully I’ll do a “recap” post in the future, with some photos of what I mean. That’s a disappointment But thank you for the heads up. I got excited when I saw this bag in the store today. Jumped online for some reviews and came across your review. Any word yet on that “recap” post as to how that bag has held up in general day-to-day use? Hey Chris! Glad you found my review. After all the people who have been asking me about this, I think I’ll try and do it this week. Keep an eye out! How about the Moleskine Backpack? What would be different? I am thinking of getting the backpack.